Posted on May 28, 2009 February 16, 2017 by Ian C.
I was wondering today what the Audi Q5 average MPG is – recently it’s on-board computer has been showing figures as high as 27mpg for my easy drive home from work (a bit lower to work in the morning, when the engine is cold). So … on 2,305 miles at 111 gallons, the Q5 averages 20.8mpg. Not great, but comfortable! I know other MINI owners get much worse mpg (and doubtless some get better) – but these figures are pretty comparable since it’s the same driver doing largely the same driving on the same routes! Posted on January 19, 2008 November 22, 2018 by Ian C.
… then it’s just a rather expensive, small car! Ever since I first saw a MINI back in 2002, and certainly ever since I first drove one, it’s been a love-love relationship with MINIs. Everyone agrees that they are not perfect cars: the rear seats are hardly practical, the ride over rough roads is shocking, and I’m sure that more can be added to that list. But, there’s something about driving them, for me at least, that is simply pure pleasure. The connectedness I think – you feel so in control of the car, the road; you get feedback from steering, from the engine, from the clutch and gears, everything. Which is why I’ve been driving nothing else from mid 2002 till now. I bought GBMINI#5 to get experience with the new engine and functionality of an R56, so that in a years time I’ll be able to order a new-design convertible knowing exactly what features I do and don’t want. In the meantime, I’d have some fun driving an R56. Well, the evaluation is over and I know now exactly what new-design convertible I’d order: NONE! For me, the R56 has lost it’s “MINI genes”; I simply don’t love driving it. 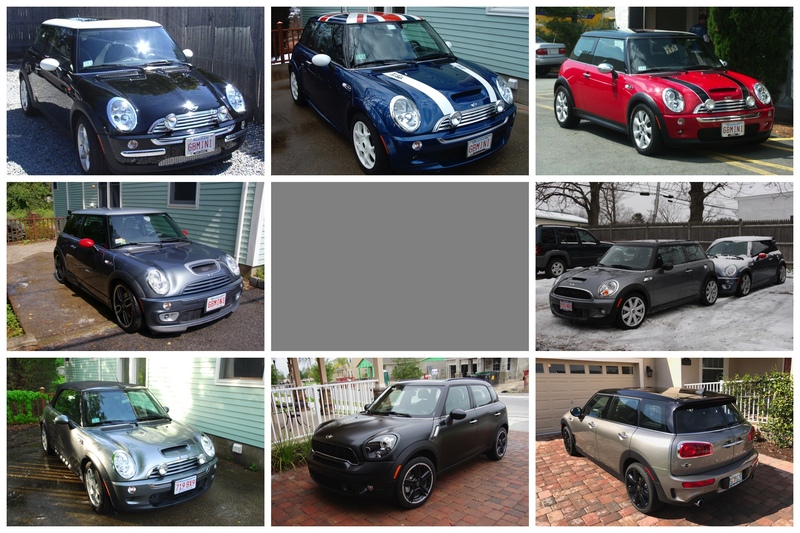 But I’m not ready to not drive a MINI; I still love MINIs. I just don’t love R56’s. I don’t feel “connected” to GBMINI#5 like I did with my other MINIs. It’s hard to describe exactly what’s wrong, but whether it’s the feel of the clutch pedal, the clutch plate itself, or the lack of engine sound to give feedback – whatever it is, it’s not a thrill to deal with it. The engine sound is a step back for me, too. I’m sure new-to-MINI owners prefer it, but I “grew up” with the supercharger whine and it’s a huge thing to lose. The steering, also, seems to be a step backwards. The default (non-Sports) mode is very light and easy, but it’s not what I’m used to. And turning on Sports mode doesn’t really improve it much, it simply makes it heavier (presumably it reduces the level of assist, but it can’t change the physical connection between steering wheel and road). The default gas pedal responsiveness is also odd – although here the Sports mode does significantly improve it. But still, the engine response is too different from the R50/53/52 engine; maybe it doesn’t have turbo lag as they claim, but it still behaves curiously like it needs a bit of time to get going sometimes. I’ll freely admit that the R56 engine has masses of power once you find it, and it can accelerate quite impressively. But even then, it doesn’t give me the “love” that I want from a MINI. Power isn’t everything – not to me, at least. So, something has to be done … sorry, something has been done. At they say, “watch this space”. I forgot to mention – the stereo in the R56 is appalling too! 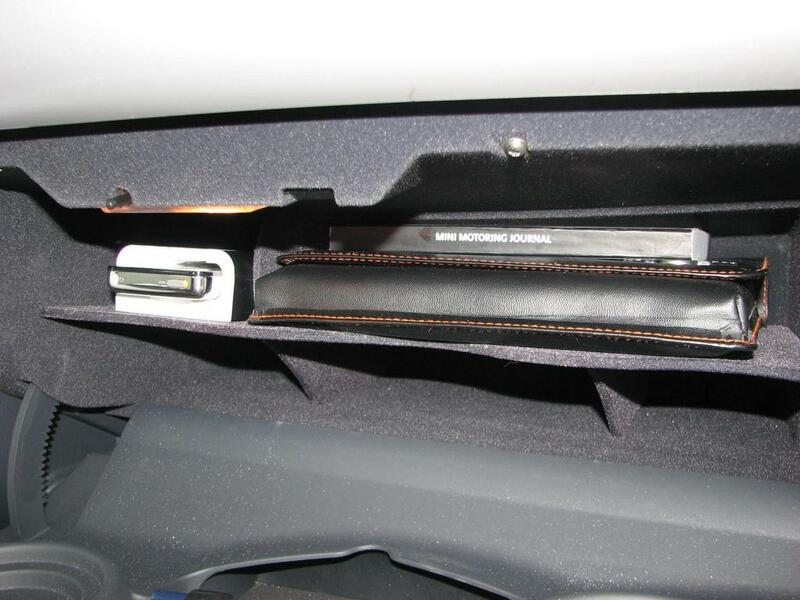 and since it’s so heavily integrated to the car, you can’t replace it. The previous generation is much more amenable to stereo upgrades. Too cold for an R56? Posted on January 3, 2008 February 14, 2017 by Ian C.
It was 10f when I left for work this morning – and that’s basically where it stayed! I took GBMINI to Sublime Restorations so I’m driving GBMINI#5 tonight … and when I started the car, she started fine but the clock was gone, and there was no trip information. Curiously the date was correct, while the time had vanished. Something else now … yesterday the R56 stalled three times when initially moving it; I assumed it was because the brakes & tires were frozen from sitting in the cold / wet for a week. But this morning, it again stalled twice when I tried to go; I had to give it LOADS of revs to have enough power to move without stalling – and this was on a flat driveway with no overnight icing! Apparently GBMINI#5 has no power when it’s cold; for the first few minutes you could feel that it wasn’t happy to run, sluggish and under-powered. 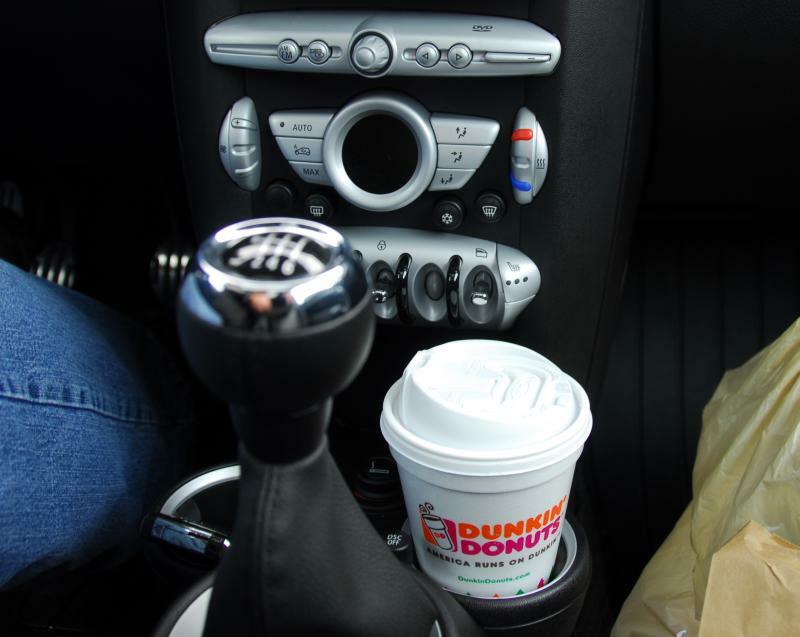 Posted on December 26, 2007 February 12, 2017 by Ian C.
So while the cupholders grew in size, the door pockets shrunk dramatically – and are harder to access due to the tiny gap between door panel and armrest/handle; more frustrating is the shrunken glove box – it’s apparently been designed to hold the MINI manuals, and nothing else! Posted on December 21, 2007 February 12, 2017 by Ian C.
To round out my opinions on the stereo system of the R56 with navigation, here’s a quick look at Sirius satellite radio. The factory system is very expensive, especially compared with a sub-$100 standalone receiver that you could connect to the AUX input … but with the factory system it’s fully integrated to the car, there’s no additional antenna on the roof, and you get your first year of service included. When you access satellite radio, the NAV screen shows a list of all channels – every one has a check mark next to it, assuming you’ve activated the receiver. Seems a bit odd to show that; why not simply omit channels that aren’t available! But anyway, you get a list of channels and you can rotate the joystick to listen to any one – with less than 200 channels, it’s much easier than the iPod! You can call up a “Details” display for the channel you’re listening to, which shows the artist/title info – but nothing else! I’m sure this would look fine on the non-NAV R56, but it looks a bit empty here. It would have been better to integrate with the channel list, like the iPod interface does. You can set up a list of 12 presets for your favourite Sirius channels, you can also access the list by Genre if you wish – but personally I find the 12 presets sufficient to cover all I need, making it extremely easy to access the music I want to listen to. Posted on December 19, 2007 February 12, 2017 by Ian C.
GBMINI#5 came with the iPod interface installed – good news because I’m not sure I’d have liked to pay $500+ for it! Well: notice first that we have “CD2” selected, and above we had “CD1” selected. The iPod interface is implemented by mimicking a CD changer; CD1 gives a menu of music in Playlist order, CD2 is Artists, CD3 is Albums, CD4 is Genres, CD5 is Podcasts and CD6 is All Songs. So to get to the Artists list, I had to switch from CD1 to CD2; to do this you simply push the joystick up, a couple of times, then rotate, then click. But then comes the really “exciting” part … I had to wait EIGHTY SECONDS for the Artists menu to appear! When it’s finally ready, it automatically starts to play the first song by the first artist – of course that’s probably not what you want, so simply push up, click, rotate left, and click. Now finally you have a list of Artists, with the first alphabetic artist shown. OK, so we want to listen to a different artist. How about Supertramp? Luckily, it doesn’t take quite as long as you’d expect – cleverly, the iPod interface is limited to 255 menu entries! So we actually can’t get to Supertramp anyway; in fact the screen above with Lucero as the last item, is the end of the menus. Alright then, how do we get to Supertramp? Well, I could build lots of Playlists to set up different ways to access my music – maybe a Playlist for “A”, “B”, etc … but I saw someone post online that method doesn’t work because the menu gets overloaded and still runs out! As you can see, what appears is just a list of songs. There’s no sub-menu of Artists or Albums first … it looks like the song list here is in Artist order (it’s displaying tracks by AudioBody), so I guess with enough knowledge of what’s in your iPod you might be able to scroll down the list to get to the song you want. Although I suspect the list of songs might still stop at 255 entries! Infuriatingly though, when it’s playing in Random mode, the skip previous/next buttons don’t skip to a different random track! Suppose you have Random play active and it selects an Artist you don’t fancy listening to today. In GPMINI with the Alpine HU I click -> (next track) and get some new random song. But in GBMINI#5, if I click -> I get the next song from the same Artist/Album; exactly what I don’t want! The only choice is to click the joystick to turn off Random play, then click again and turn it on again. I really wish the iPod interface was better. It should be much faster (my Alpine/iPod interface is instantaneous when I select by Artist/Album/etc), and there should be no problem with having music collections of more than 255 Artists/Albums. As it is, I don’t expect MINI to do anything different, and it will be hard for an aftermarket company to develop something – the MINI is becoming more and more proprietary and difficult to change. I wonder if the non-NAV iPod interface is any better. Maybe it’s slow on the NAV because it has to display more on the bigger screen? 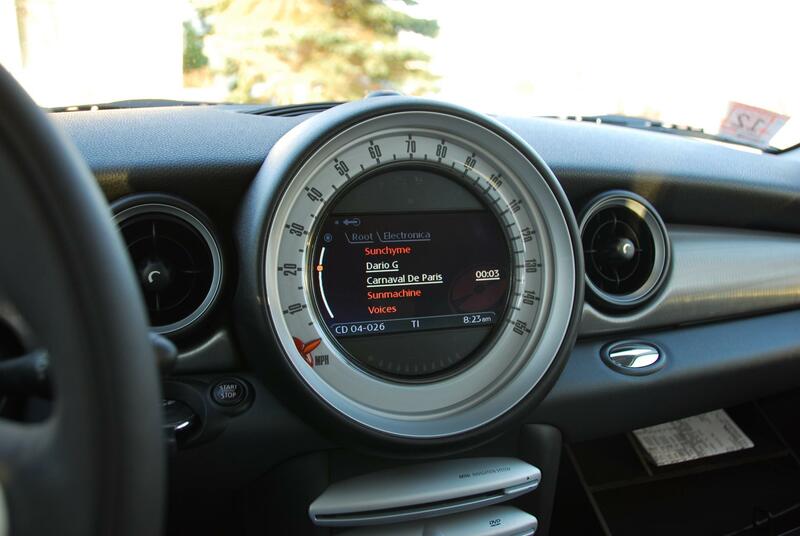 I hope one day to try my iPod in a non-NAV R56. But much better is out there; why can’t we have it? Oh, nearly forgot – one more ludicrous limitation of the R56 iPod interface! It doesn’t remember where you are in the current playing track, when you turn the car off – well, if you switch off for a short time it does remember, but after a few minutes it will revert back to the beginning of the track when you come back to the car! That’s really annoying when you’re listening to a long track, and never get to the end of it.